Over the eight years, I have been within the PV (photovoltaic) solar installation industry, I have noticed one common trait that most householders who have installed solar panels possess – Pride. 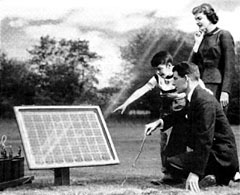 PV solar panel pride since 1883. Technology comes in many different guises, and very few manage to invoke high amounts of passion, pride and delight. Earning a better return than your bank can offer. Beating the energy bills and companies. …are some of the more common reasons why solar panels can stir up human emotions, unlike your washing machine. More people would invest if they knew the financial benefits, so I would, therefore, like to share with you, some of the feedback we receive from those early pioneers to the most recent investment savvy homeowners. “Seeing the electricity boards meter running backwards, totting up precisely what I am selling back to the grid, is one of the most satisfying sights I have seen in a long while. Our 3KW system has been running for a few weeks. We are so pleased with the whole process and the quality of the installation that we felt compelled to write to you. Right from the time that your representatives visited our bungalow to explain what you could offer our needs, right through to the installation process was smooth and easy. Where kept informed at all stages of the short process, and we were even able to have the system fitted, at a time to suit our holiday plans. We have had some people ask us about the system, and all have been impressed. “We had a PV solar panel system installed to reduce our hot water heating bills. The system is efficient as we only have to top up the system, with the gas heater for about an hour a day, even though the weather has been exceptionally wet to date. “My wife and I like to do our small part in improving our carbon footprint. Solar panels are a good thing for the future, and we can share in the enthusiasm this technology currently enjoys, especially as we would end up saving money. Once we had agreed to go ahead with an installation, which took less than a day with the efficient way the installers did their work. “We have recently had a solar heating system installed to provide for the outside swimming pool. We are thoroughly enjoying the benefits of free additional heating which makes our pool both enjoyable and economic and extends the season both in spring and autumn. As gas prices increase the value of energy provided by our panel’s increases, making this an extremely worthwhile investment. “Our solar energy system was installed last November. We watched with much interest the monitor afterwards. Often we have been surprised that, even on a grey day, electricity is generated sufficiently to offset the power used to run our appliances. We wait with much impatience for a long hot sunny summer to arrive. We decided to put our south-facing roof to good use with PV solar panels and are incredibly pleased to have made that choice. We are acutely environmentally aware and recognise the need for microgeneration where possible. On the day of the installation, the installers and the engineer carried out the work cleanly, efficiently and with no intrusion into our home. “We chose a solar tube installation because it is the most efficient and efficient system to meet our environmental and cost-effective requirements. The fitting, despite a small two-day delay, caused by the weather was undertaken within the time specified without significant disruption to the running of our home. We only lost water and heating for a short time while the new storage tank fitted and everything was made fully functional soon after installation. Everything was cleared up and left tidy, even returning the next day to complete the fitting of the solar panels themselves. This page is only a small snapshot of the thousands of homes who have adopted this fascinating technology since my early fascination with alternative technologies, and through experience, I have learned that PV solar panels are the most beneficial to most people of all the green energy installations. Through various reasons, these technologies are misunderstood by the wider public, but if people could learn about the actual benefits, then more people would invest, more people would gain from its perks and more importantly, would feel the level of pride similar to buying your first car.